Andrew Slater, a research scientist at the National Snow and Ice Data Center in Boulder, has a website that maps daily changes in snow water equivalent over Colorado, using a shell script for data retrieval and IDL for visualization. 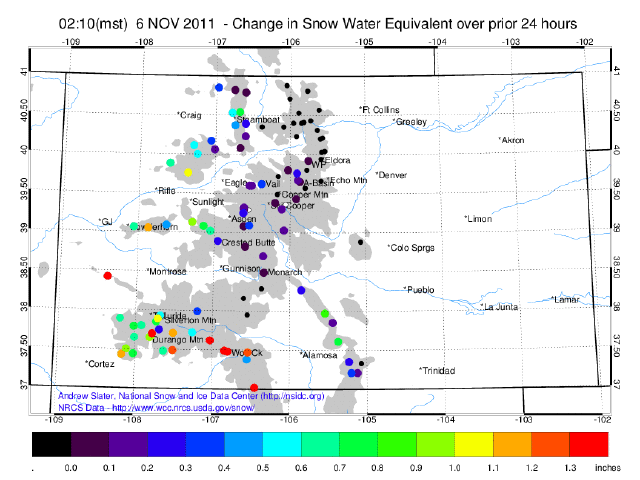 "The image shows the change in snow water equivalent (SWE) over the last 24 hours at all available Natural Resources Conservation Service Snow Telemetry (SNOTEL) sites in Colorado. Grey shading denotes areas that are over 2850m in elevation. The image is updated every three hours. As a very rough rule of thumb you could multiply the SWE by 10 to obtain a new snow depth. SNOTELs are installed for the primary purpose of monitoring water resources (hence the major rivers are shown) but it also makes an excellent visualization of where the best skiing is likely to be." Thanks, Drew! If you’ve made a cool application with IDL that you’d like to share, please let me know and I’ll post a link to it.